During our time with the Pixel Slate at Google’s hardware event, one particular accessory truly grabbed our attention: The Brydge G-Type Wireless Keyboard. I have little doubt that we’ll see plenty keyboard/trackpad accessories for the Pixel Slate over the course of the next few months, but this particular device is truly designed from the ground up to work seamlessly with the Pixel Slate. From the build materials to the color, the Brydge G-Type almost looks like an accessory made by Google for the new tablet. Though it is not, Brydge clearly worked alongside Google to make a keyboard that works beautifully with the Pixel Slate and looks insanely good while doing it. Brydge is no stranger to high-end hardware, making keyboards for iPad Pros and Surface Pros over the past few years. This is their first Chrome OS keyboard, and it looks, feels and performs just as good as its predecessors. The 3-stage backlit keys are clicky and responsive, the trackpad is glass and has a wonderful feel and action, and the hinge that holds the Pixel Slate is firm and confidence-inspiring. Add to this the Brydge G-Type battery lasts for 6 months on a single charge and can get juice via USB-C (which you’ll have around if you are using the Pixel Slate). If you can’t tell, I’m already a big fan. Sure, the keyboard connects over Bluetooth, but as you can see in the video, the connection is fast and out of your way in seconds. 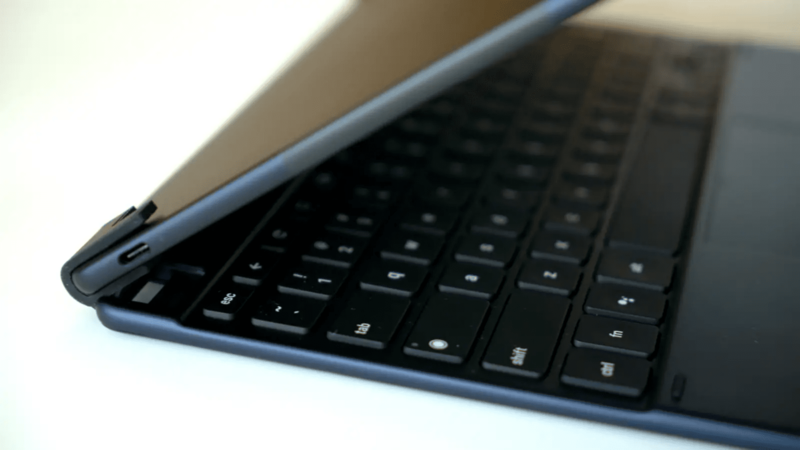 I like the thought of having a more clamshell-like experience for the Pixel Slate than what the Google-made keyboard cover provides, but I do realize you lose a bit of the case covering going with Brydge’s solution. All in all, it’ll be to each his own. I’m undecided which route I’ll go when I purchase a Pixel Slate and I don’t know that I can make my mind up without actually using both in real life for a little bit. Lucky for you all, that’s exactly what I’ll do and report back after I’ve nailed down a more definite opinion. At $159 on their website, this solution would also save you a cool $40 over Google’s keyboard, so that’s another thing to consider. For now, check out the initial hands-on video to tide you over until it arrives.